We had a 60% chance of thunder and lightning in Lambeth at 4PM, so I didn't bother going out, but nothing came of it. Now I'll probably get struck by lightning going for a Chinese take-away in a few minutes' time! I was brought up in the 60s with pounds, shillings and pence and feet and inches, but always, for some reason, centigrade - Fahrenheit numbers are meaningless to me, although I know how to convert them to centigrade. Yes but it is a dry heat. .... although I know how to convert them to centigrade. Ya, me too 46 degrees. It helps to have a swimming pool, sort of. and showers. I haven't got a pool though. I'm in Milan, Italy, at the moment. The weather forecast said sunny and very hot. 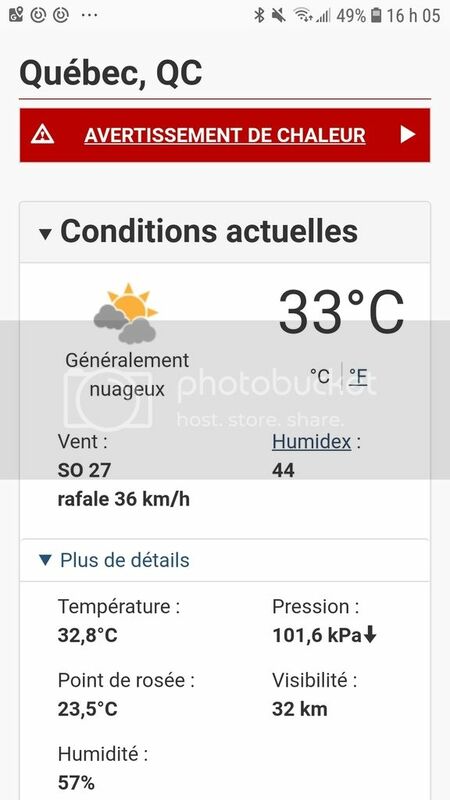 Very hot is true (32C) but there was a heavy rain shower just some minutes ago. I’m camping at Panther Creek State Park, near Morristown, Tennessee, and storms passed through the area late yesterday afternoon, and the temperature dropped to a comfortable 71 degrees after the storms. We turned off the air conditioner and slept with the windows open. Woke up to birds singing. I'd love a trip to Down Under. It just isn't on my wife's bucket list. I spent six weeks in Montreal and Quebec City many years ago in the Fall. What a beautiful part of the world. I loved the people and its history. I'd like to take my wife there since she hasn't been. I'll remember not to go in the summer. On the subject of humidity, A few years ago I had a business trip scheduled for Tampa, Florida in the summer. I was pleased to see that the temperature was only 86 degrees and was looking forward to getting out of the hot weather in Arizona. I had forgotten about humidity even though I had lived in Orlando/Tampa for 15 years earlier in my life. It was so damn uncomfortable I couldn't wait to get back to the desert. They say that, in the sunbelt states of the US in the summer, you can either boil or bake. I prefer baking. Skies: Clear, besides the lingering fireworks.